Home > Holster > HOLSTER for the Ruger Mark Series! Shooters demanded it; the new Black Max Series HMK holster is designed to fit the Ruger® Mark Series (MK-I, MK-II, MK-III, MK-IV & 22/45) .22LR pistols with or without an optic or a suppressor. 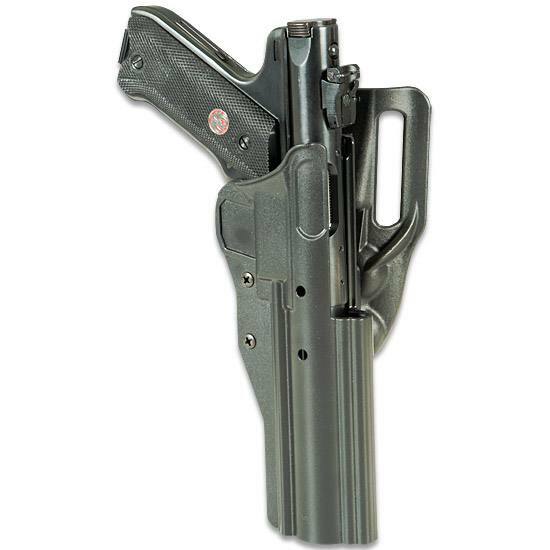 This Black Dog HMK offers an adjustable retention for the various versions of the Mark Series pistols as well as reversible design for left or right handed shooters. Accommodates Slab Side, Bull Barrel, and Tapered Barrel models in all lengths. What is the difference between the two belt loop designs? 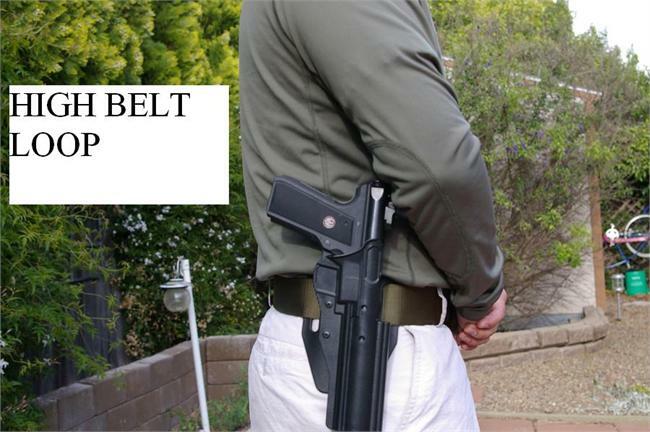 The two belt loop options allow your pistol to hang either higher or lower relative to the belt. You can purchase the holster in either configuration and buy the other mounting paddle for $5 if you would like to change the height of the holster. 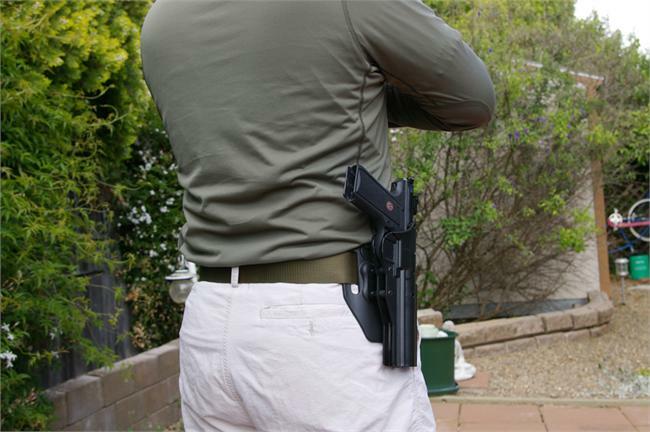 ° The holster lets the gun angle away from the body for a quick draw and works great for rim fire competitions. 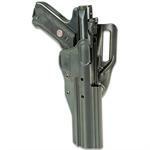 *Will not fit correctly with thumb rest pistol grips, some user mods required. * Will fit in the Ruger .22/45 Light but you will have to do some adjusting. Take screws all the way out and stretch to make the opening wider. Reassemble. You might use a light file and file if there is any rubbing to have the perfect fit. 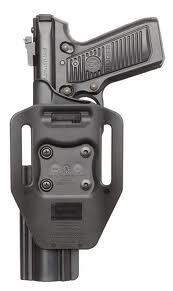 * If you have a .22/45 light with a Weaver Rail, according to past customer feedback, this holster will be too tight. Q: I have bought this holster. I use it for my 22/45 Mark III 6.88" barrel. No problem. Holstering I get a satisfying "click", but for unholstering (straight up) it's not easy. I have to tug at it. Is there a "trick" direction or maneuver to unholster smoothly? A: The front sight of most Ruger MKI, II and III pistols is a Patridge style and this may be hanging up by catching on the front lip of the holster. The friction screw under the trigger guard may also be too tight and may require adjustment. 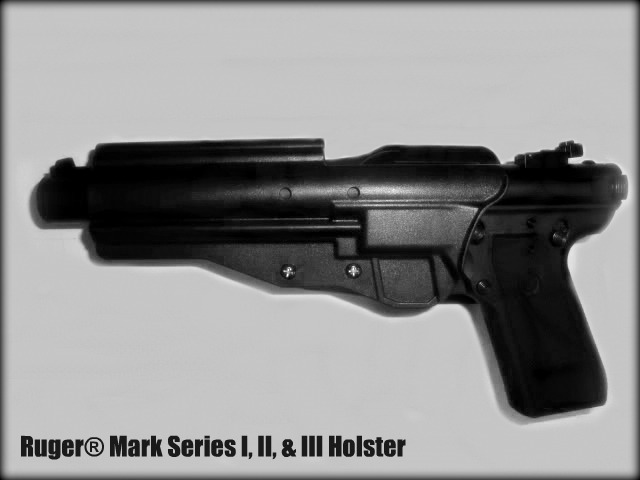 Q: Will this holster fit a Mark II government slab side 6 7/8" barrel? Q: Will this accommodate a bull barrel with a compensator installed? Q: Will it fit the 10 1/2 inch bull barrel? Perfect holster for ccompetition or hunting. Secure fit and allows for upper rail attachments with no obstruction when drawing. I highly recommend this holster! Thanks a million Black Dog Machine for superb service and quick shipping. Super holster.I have an Bushnell Haloscope mounted on a 22-45.Fit is great and holds weapon snug.I bought both the high and low belt adapter and use both.Learning how to draw gun out of holster took some practice but works just fine.Keep the front sight from rubbing the top of the holster and gun removes smooth.Thanks for a great product. Retention is very tight; great if trail running, poor for speed draw. 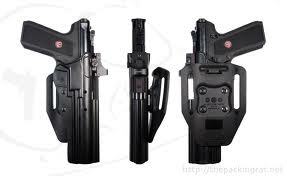 I anticipate a corner on the "Mark" et if Black Dog Machine offers a paddle holster add on with angled options of draw. Will not work with extended bolt releases i.e. : Volquartsen; so if you have one of the new Volquartsen Comp. grips with the extended bolt release, be willing to swap out the bolt release for the stock low profile Ruger one. Further room for improvement would include an index finger "Serpa-like" release instead of the rubberized screw-tension design. This would negate the need to use non-dominant hand to hold onto holster while drawing with dominant hand... it is that tight without modification. I am considering teflon spray to coat the internal friction rails. I am happy with the holster but there was a problem related to removing the Mark 2 from it when holster with the gun in it is not on your belt and you're holding them both in your hands. Problem was that while using my left hand to remove the pistol from the holster while my right hand was holding the holster and wrapped around the upper open portion of the holster behind the sight cover the Ruger front sight cut DEEPLY into my hand as the weapon retracted fast after the retention pressure generated by the holster was overcome. Beware of this Happening. Maybe the manufacturer could extend the sight cover portion of the holster about 3 inches further so as to protect users from the very sharp undercut of Ruger front sight even if it raises the cost by a Dollar per holster. This is one well thought out product. A shoulder holster of this type would be even cooler.